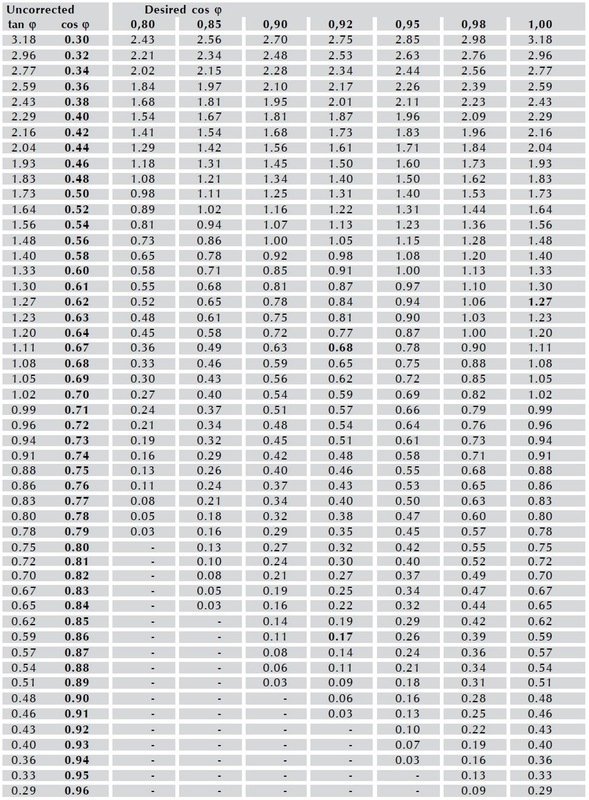 Today, we will explain how to calculate the capacitor KVAR rating for buildings and power plants (group compensation). By using The Utility Company’s Invoice. Ammeters and power factor meters are often installed in the main low-voltage distribution board, also we can use clamp meters for measuring current. Measurements are made in the main supply line (e.g. transformer) or in the line feeding the equipment whose power factor is to be corrected. Measuring the voltage in the power distribution system at the same time improves the accuracy of the calculation, or the nominal voltage (e.g. 380 or 400 V) may simply be used instead. If the desired power factor cos Ø was specified, the capacitor power rating can be calculated from the following formula. Step#1: search for Existing Power Factor on Table-1, move across table to Desired Power Factor. The number represented is your multiplier number K.
Step#2: Multiply KW by the K multiplier to get the proper Capacitor KVAR Rating. For more information about measuring the power factor, please review our article “Power Factor Correction Capacitors Sizing Calculations – Part Six”. Measurements made as described above naturally only give momentary values. The load conditions can, however, vary considerably depending on the time of day and the season of the year. Measurements should therefore be made by someone who is familiar with the installation. Several measurements should be made, ensuring that the consumers whose power factor is to be corrected are actually switched on. The measurements should also be made quickly - if possible reading all instruments simultaneously - so that any sudden change of load does not distort the results. 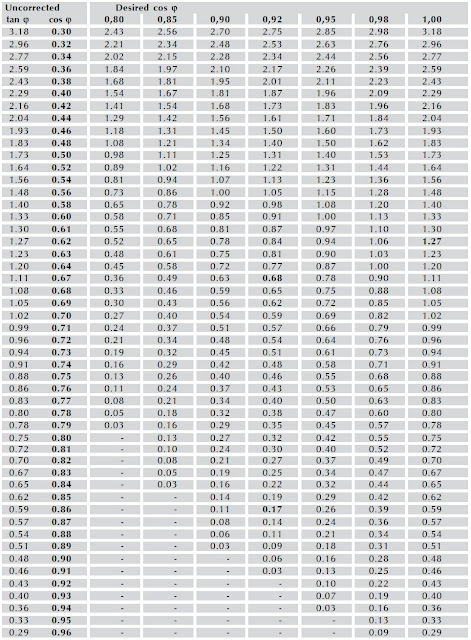 Calculate the KVAR rating for the power factor correction capacitors. First, trace a line segment from the value of the load KW to the initial cosϕ then to the KVAR line will give Initial KVAR value. Then trace a line segment from the value of the load KW to the desired cosϕ then to the KVAR line will give final KVAR value. Finally, subtract (final KVAR value - Initial KVAR value) this will be the desired Capacitor KVAR Rating. An 80 KW load with power factor 0.64, calculate the required KVAR capacitor rating to get a 0.9 PF by using the nomograph method. First, trace a line segment from the value of the load 80 KW to the initial cosØ = 0.64 then to the KVAR line will give Initial KVAR value = 96 KVAR. Then trace a line segment from the value of the load 80 KW to the desired cosØ= 0.9 then to the KVAR line will give final KVAR value = 38.4 KVAR. Finally, subtract (Initial KVAR value – final KVAR value) = (96 - 38.4) = 57.6 KVAR this will be the desired Capacitor KVAR Rating. Using this calculated value of tan Ø and the desired cos Ø we can then obtain the factor k from Table-1. The parameter f is the ratio of the meter current transformers. The meters work with 150/5 A current transformers. Calculate the KVAR rating for the power factor correction capacitors. For a desired cos Ø of 0 .92 a factor k of 0.65 is obtained from Table-1. The required capacitor power rating can be determined relatively easily and accurately from the power supply company´s monthly invoice. If power consumption is constant throughout the year, the annual electricity consumption or any desired monthly invoice (but not for the month in which the annual shutdown occurs), may be taken as a basis. If seasonal variations are apparent, an invoice from the "high season" must of course be selected. If regular and off-peak tariffs are measured separately, usually the regular tariffs are used for calculation purposes. It can be assumed that the capacitor power rating derived will be adequate to cover the reactive current circulating at night. In special cases, however, where the less expensive off-peak power is used predominantly, the off-peak consumption may not be neglected. Step#3: Multiply KW by the K multiplier to get the proper Capacitor KVAR Rating. Step#2: The actual value of cos Ø can now be obtained from Table 2, since the calculated tan Ø of 1.11 corresponds to a cos Ø1 of 0.67. 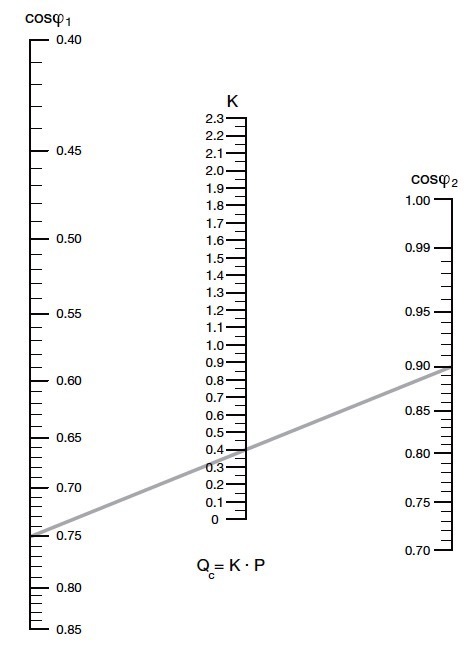 A factor k of 0.68 is then obtained from Table 2 to produce a desired cos Ø2 = 0.92. In this case a standard capacitor rating of 75 kVAr must be selected. If a possible future expansion of the facility is also to be taken into account, then a somewhat larger capacitor, (e.g. 100 kVAr) could also be selected. Note: In this case the utility company bases its invoice on the maximum amount of power drawn by the user during the given month. It is advisable to select a capacitor power rating that will achieve a cos Ø2 of 1. Step#1: From Table-1, with an uncorrected cos Ø1 = 0.62 and a desired cos Ø2 = 1, a factor k of 1.27 is read off. For this duty a reactive power control relay with a capacitor power rating of 150 to 175 KVAR is arranged as a switched variable bank. 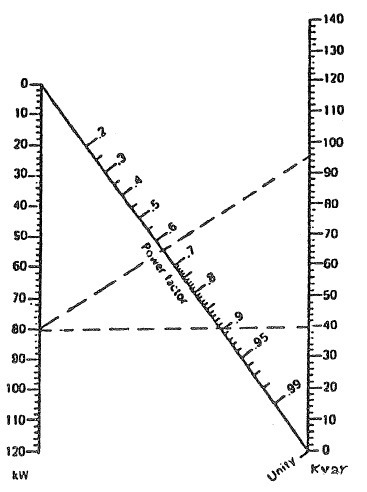 The multiplier factor K can be determined by using the above table-1, and also it can be determined by using the following Nomograph shown in Fig.2. Then, the intersection of the line with the middle graduated scale, gives the value of K.
When selecting automatic bank units, select the closest KVAR rating to the amount of KVAR desired based on present and future applications. If the desired rating is not listed, the next higher KVAR rating should be selected. When selecting fixed bank units, however, select the KVAR rating WITHOUT GOING OVER the desired capacitance level. In the low voltage field, where insulation problems are less important, the delta connection is usually preferred for the capacitor bank, since it allows a smaller sizing of the capacitances of each phase. In the next article, we will explain the Effects of Harmonics on Power Factor Capacitors. Please, keep following. What is a power factor? Why utilities charge a power factor penalty? What causes low power factor? Benefits of Power Factor correction. How to make Power Factor Correction?